ALMOND Vosotros scored a career-high 26 points as Cebuana Lhuillier defeated MJM M-Builders, 87-72, on Monday in the PBA D-League Aspirants Cup at the JCSGO gym in Quezon City. Vosotros played the best game of his young D-League career to lead the Gems to their third win in six outings while snapping a two-game losing skid. They moved to a tie for fifth place with AMA Titans. Norbert Torres, a teammate of Vosotros with the La Salle Green Archers, had 15 points and 13 rebounds while Kevin Ferrer added 11 points for the Gems. Mac Belo scored 17 points for the M-Builders, who are now in last place with a 1-5 win-loss record. Cebuana Lhuillier (87) – Vosotros 26, Torres 15, Ferrer 11, Bautista 9, Lopez 8, Guinto 6, A. Mangahas 5, Enciso 2, Villahermosa 2, Arellano 2, Canlas 1, J. Mangahas 0, Sarangay 0. 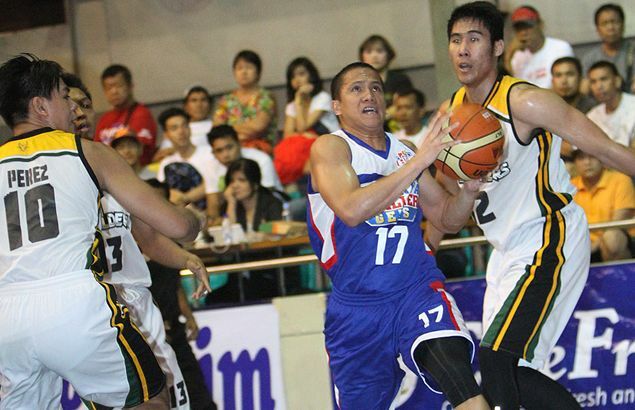 MJM M-Builders (72) – Belo 17, Khobuntin 15, Alolino 10, Tolomia 10, Pogoy 6, Cruz 5, Mendoza 3, Perez 2, Neypes 1, Jose 0, Alberto 0, Inigo 0, Remulla 0. Quarterscores: 25-22; 41-37; 61-53; 87-72.